This amulet features the "Red Robe Laughing Buddha Riding on a Precious Elephant Blowing Fire". Signifying triumph over hostility, the Laughing Buddha promises power, authority, happiness and influence. The Precious Elephant possesses supernatural ability to travel through the heavens and overcoming of obstacles and illusions. The elephant blowing fire helps to ward off evil, maneuver your life smoothly against all tides, combat resistance and exercise control over situations that are unstable and lack clarity. Inscribed with "Li Hexagram" which represents the BIG FIRE, it becomes an ultimate cure that effectively burns away all forms of quarrelsome energy (wood element). Quarrelsome energy normally causes disputes between lovers, problems with office authorities, lawsuits and quarrelsome neighbours. Also featured are the phoenix to increase good reputation and improve popularity and the tiger that attacks your gossiper. These are the two of the four celestial guardians that safeguards your good name. Lastly, it is consecrated with the taoist incantation of "Winning in Court Cases" to ensure you will be unharmed by any legal actions. 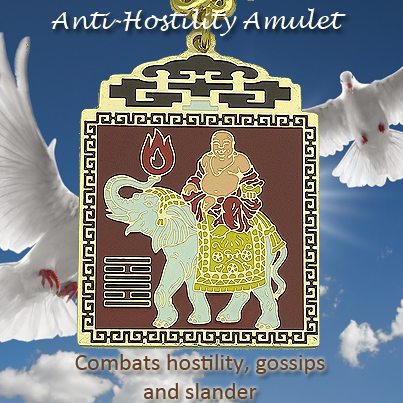 This amulet is an excellent anecdote to combat hostility, gossips, slander, disputes, conflicts, lawsuits and quarrels in your family, office and social circle. It is also excellent at fanning off enemies. The amulet improves human interaction and inter relationships. You can carry this amulet to anywhere you encounter problems, to make those who are angry with you change their minds towards you and have affection for you. It is best to create respect, harmony and love among family members and friends. It is especially useful when the elderly are facing rebellion from rude children, younger generation or co-workers. It is also effective in magnifying your social life with more friends and intensifying platonic friendships into intense love relationships. 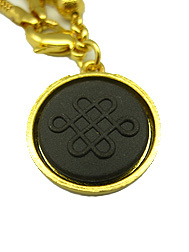 This amulet will overcome quarrelsome energy at home, havoc, dispute between lovers, problems with office authorities, lawsuits and quarrelsome neighbours, which is usually caused by Quarrelsome Star #3. Note: This amulet is energy infused and emits energy unendingly. Item comes with certificate of authenticity. Free gift box. Bad temper, quarrel and scolding are widely seen due to our hectic modern living because stress is part of our life where we need to cope with. Many people are suffering from stress nowadays and giving others unpeaceful treatment. When our mind is unpeaceful, we cannot concentrate in our work and can jeopardize a lot of areas in our lives. If we suffering from nagging people at home or in the office, our career can go to jeopardy. Losing our temper and initiating quarrels are sometimes unavoidable when there are quarrelsome stars looming in our life palace. That is why sometimes we can end up in big trouble without us realizing the true reason, which had been led by our sudden quarrelsome attitude with our loved ones, our subordinates, our superiors, our friends, our parents, our relatives or even with strangers. Like it or not, quarrelsome energy in our lives brings us bad aura on our crown chakra and heart chakra which can bring extensive bad luck that can last for a long time forward. Therefore, it is very important that we must not lose our temper in order for us to enjoy good feng shui and good luck. Once the quarrelsome energy is dissolved, it will help to create positive thinking, a better focused mind, confidence and innovativeness, progress and prosperity. This will reinforce our energy levels so that we can benefit in all aspects of our lives. 3. Display it in locations of homes where the natal flying star map has the Quarrelsome Star #3 is, especially when #3 meets with #2. 4. Display in the West of the family room to prevent the younger generation from showing disrespect to the elderly. 5. Display in your bedroom at your personal "nien yen" direction if you are seeking for a happier life and wanting to forge more friendships.